Serving as Stanford's defensive coordinator (2012-13), Derek Mason had an integral role in the Cardinal claiming two Pac-12 titles and playing in back-to-back Rose Bowls. 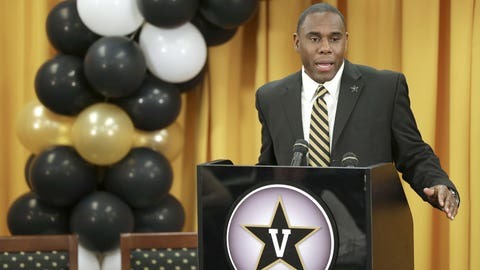 NASHVILLE, Tenn. — New Vanderbilt coach Derek Mason knows exactly what his new players are feeling after losing their popular and successful coach. It happened three years ago at Stanford, soon after he spent the 2010 season as secondary coach for former Cardinal coach Jim Harbaugh. The San Francisco 49ers came calling and hired Harbaugh away, leaving his players in a lurch. Even though Stanford offensive coordinator David Shaw was promoted to follow Harbaugh, it didn’t lessen the sting. That’s among the emotions the Commodores have felt since last Saturday when three-year coach James Franklin, who guided the program to unparalleled success, was hired at Penn State. "In looking at the transition (at Stanford), it was hard," said Mason, who was introduced Saturday as Vanderbilt’s 28th head football coach. "Our kids were really hurt through that process. Everybody assumed that it was more about coaching than it was about the players." With Shaw leading Stanford the last three years, and Mason serving as defensive coordinator, the Cardinal reached new heights, winning consecutive Pac-12 championships the past two seasons and, consequently, earning back-to-back Rose Bowl berths. "Dave never tried to be Jim Harbaugh," Mason said of Shaw. "I’m never going to try to be James Franklin. I’m Derek Mason. I’m your new head coach. … I just want to make sure that we just continue to move this thing forward." Leading one of the nation’s best defenses, Mason soon became a hot head-coaching prospect, much like other former Stanford staffers who have moved to other jobs. In recent years, he had emerged as a candidate for openings at Louisville, Washington, UConn and Army. On Friday, Vanderbilt athletic director David Williams finally made Mason a head coach, culminating 20 years of experience on the college and NFL levels. "It was evident that the football world is aware of the tremendous progress our program has made," said Williams, who confirmed that around 70 candidates applied for the job. "And that was reflected by the deep pool of talent that showed an interest in our position." Other possible candidates included Indianapolis Colts offensive coordinator Pep Hamilton, a former Stanford offensive coordinator, St. Louis Rams offensive coordinator Brian Schottenheimer, Louisiana-Lafayette head coach Mark Hudspeth and Vanderbilt offensive line coach Herb Hand. Under Franklin, the Commodores had many program firsts, including going to a bowl game three straight years and winning the last two, including the BBVA Compass Bowl over Houston on Jan. 4. The team also had consecutive nine-win seasons for the first time in program history. Consequently, Franklin became a popular candidate for various college and NFL coaching vacancies. But Mason was quick to note the Vanderbilt football program was more about the players than its coach, much like what happened when Harbaugh was followed by Shaw at Stanford. "Coaches coach, players play," said Mason, 44. "In my last three years at Stanford, I never got on the field and got between the white lines and made a play." But his players on the defensive side of the ball sure did. While facing seven ranked opponents last season, Stanford ranked third in the country in rushing defense (89.4 yards), 10th in scoring defense (19.0 points) and 16th in total defense (343.1 yards). The Cardinal ranked among the top 15 nationally in defensive efficiency the last three seasons. "He has a winner’s mentality," Commodores senior defensive end Kyle Woestmann said of his new coach, who met with the team for the first time Friday night. "And not that Franklin doesn’t, but I thought that mentality was to be good. And that was what he was going to establish. "But coach Mason’s mentality is to win championships. When we met with him, the first thing he said to us was, ‘We’re not going to talk about winning the SEC championship. We’re going to talk about winning the SEC East.’ Once you win the SEC East, now you’re in the SEC championship (game), now you’re winning the championship." One approach Mason said he learned under Harbaugh, whose 49ers play Sunday at Seattle in the NFC Championship Game, was to have a "blue collar" mentality. He remembered Harbaugh giving each of his Stanford assistants "old gasoline shirts" with their names included. "It was a blue-collar shirt," said Mason, a 2012 finalist for the Broyles Award given to the nation’s top assistant coach. "So, we wore those things. Now, I know it was a little weird. But we wore them and walked around and that was his message. "His message was, we were going to be the blue collar version versus (Southern Cal), versus all those programs that looked down at what Stanford was. He said, ‘We’re coming to get you now. Not later, but now.’"
Prior to joining the Stanford staff in 2010, Mason was assistant defensive backs coach for the Minnesota Vikings from 2007-09. Other coaching stops include Ohio wide receivers (2005), New Mexico State wide receivers (2004), St. Mary’s associate head coach and defensive coordinator (2003), Utah wide receivers and special teams (2002), Bucknell secondary (1999-2001), Idaho State running backs (1997-98), Weber State wide receivers (1995-96) and San Diego Mesa College wide receivers (1994). A Phoenix, Ariz., native, Mason was a two-year starter and four-year letterman at cornerback at Northern Arizona. Among Mason’s first orders of business is to salvage a recruiting class that had wavered around being ranked 30th in the country prior to Franklin’s departure. But it has fallen to No. 59, as ranked today by Scout.com. The list of commitments has dwindled from 20 to 13 or less. "We’ll be back out there in 24 hours," Mason said of recruiting that leads up to National Signing Day two weeks from Wednesday on Feb. 5. "I think most young men wanted to know who their head coach was going to be. "In terms of recruiting, I’ve been to Georgia, Florida and Louisiana," Mason said. "I’ve been in the South recruiting for at least eight years. When you look at my career, it speaks to what we like to do and the kind of men we like to have on our team. We’re looking to take this Vanderbilt brand nationwide." Mason was noncommittal about assembling his staff, saying only the process was under way. But he was firm in what he expected to do at Vanderbilt with his first opportunity as a head coach. "We will educate and graduate our young men," Mason said. "That is what the education is, that is what it speaks to. On the football side of things — SEC East title, here we come. Make no bones about it, if you can’t talk about it, you can’t be about it. "This program is not about me. It’s about we. It is about us. It is about how we carry the torch." And that suits Woestmann just fine. "He’s not talking about being upper tier," he said of Mason. "He’s talking about being the best. That’s the kind of a mentality that everybody on the team had, so it’s nice for him to come in here and be the leader that wants to … go from good to great."